The final week of the Spring was rather exciting. Indy Eleven remained undefeated but, more importantly, rallied to score the four goals needed to win the Spring title over the New York Cosmos. It was an exhilarating performance from Indy as they thrashed the Carolina Railhawks. 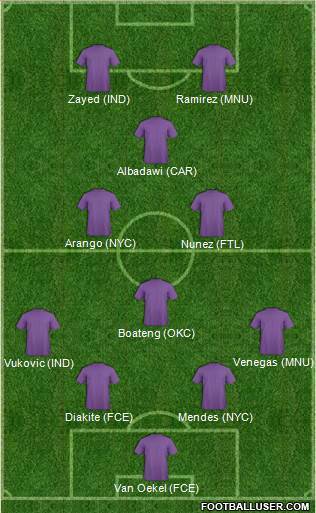 I wanted to wait until after the midweek US Open Cup games to present my Team of the Spring. My thinking was that the #USOC2016 performances should be considered. In so doing, I figured I’d also wait on putting out my Best XI for Week 11. Better late than never, I suppose. So, first, let me present the Best XI for Week 11–11 for 11. It’s fairly straight forward. Week 11 was about goal scoring. Folks had nothing to lose, so the matches opened up. FC Edmonton’s Jake Keegan was pushed out wide left and picked up a brace. Indy Eleven’s hero was Eamon Zayed with his hattrick. Minnesota striker Christian Ramirez scored and provided an assist. Although he doesn’t get the praise he should, Ottawa’s Carl Haworth has been putting in very good performances in manager Paul Dalglish’s ill-fitting 4-3-3. Since coming over to the States, central midfielder Joe Cole as been a gem for Tampa Bay Rowdies. Minnesota’s Brazilian Ibson has shown himself to be perhaps the best attack-minded central midfielder in the league for the passed two seasons. Indy Eleven’s leftback Nemanja Vukovic put in another stellar performance in support. Centerbacks Tam Mkandawire for the Rowdies and Damion Lowe for Minnesota quietly went about their business of stifling attackers. Rightback Eddie Edward with Edmonton put in a solid shift and Rayo OKC’s ‘keeper Daniel Fernandes did as well. All in all, a good week. But now for the big one, the Team of the Spring. It’s easy to simply cherry pick the biggest offensive threats and squash them together in to a mishmash eleven. I would rather take a slightly more nuanced and inclusive approach. Thus, the Team of the Spring is a gameday eighteen. Defenses have been spotty this Spring but certain players stand out. In Edmonton, centerback Pape Diakite has been a revelation (sixty-eight clearances this Spring) and with Indy Eleven leftback Nemanja Vukovic has made the just up a league with ease. The most consistent defense has been that of the New York Cosmos. Most of its defensive line started the entire Spring (righback/centerback Hunter Freeman, leftback Ayoze, and centerback Carlos Mendes) and that goes a long way towards success. Just ask Indy Eleven. Also starting every match was central midfield spark Juan Arango, his four goals, three assists, and over thirty shots makes him one of the most dangerous center mids in the league. Even though Niko Kranjcar has had a good Spring, it’s been Arango that has been the most impactful signing for the Cosmos. In a similar vein, on paper leftback/left midfielder Michel for Rayo OKC has been his team’s most productive member with five goals in just seventeen shots (however, penalty kicks tend to skew that stat). Yet I would argue central midfielder Derek Boateng has been the brightest star for the expansion side. Boateng’s control of the midfield, winning balls and distributing, has been a constant and the most competitive aspect of the team. Goal scoring is the thing most fans look to but the goal creators are perhaps the most dynamic players on a team. NASL is fortunate to have a good mix of creative players at several positions. Central attacking midfielder Nazmi Albadawi for Carolina Railhawks is finally having the season so many of us thought he would last year. Albadawi has a goal and four assists and is routinely the man behind the man (what I like to call the second-assist). Similarly, Minnesota United’s rightback Kevin Venegas has a goal and five assists. Venegas has always been one of the best fullbacks around, but this year he’s pressing to be considered the best player in the league. The Ft. Lauderdale Strikers were wretched to begin the Spring but with the arrival of central attacking midfielder Ramon Nunez all that changed. Nunez has scored one while notching three assists making sure everyone on the team plays up to his skill level, not down. Striker Christian Ramirez is having a good start to the season netting five goals in the Spring and two assists. Indy Eleven started out anemic in attack but then Eamon Zayed found his form and ended up leading the Spring in goals with six. Three goalkeepers have a goals-against-average below 1 (FC Edmonton’s Matt Van Oekel, Indy Eleven’s Jon Busch, and Tampa Bay Rowdies Matt Pickens). VanOekel only allowed seven goals in, managed four shutouts, with twenty-four saves. Busch helped lead his team to an undefeated Spring, only losing in the US Open Cup on penalty kicks to Chicago Fire. It’s been a great Spring & the Fall is looking to shape up into an equally competitive campaign. Welcome to Puerto Rico FC! Good luck to all teams & cheers to all supporters!